Last winter was, one fears, a taste of what we will see more of as the planet warms: record global temperatures translated into an eastern season where brown was the dominant color. The parking lots at Breadloaf, Craftsbury and the few other venues capable of making snow filled with cars from around the region, and diehards got used to skiing the same few kilometers. The parking lot at North Creek’s Ski Bowl started filling up, too – and the result, beginning this year, will be an unexpected but very welcome treat for Eastern skiers: a new homologated race course, with full-on snowmaking, not to mention lights. From last year’s disastrous washout, in other words, may have sprung one of the nation’s most exciting new courses. The Ski Bowl is historic skiing territory. Back in the 1930s, North Creek was one of the country’s first ski “areas.” Skiers arriving by train from Grand Central would climb into the pack of pickups, and locals would drive them to the top of a nearby ridge, where they’d plunge down woodsy trails and end up in the Bowl, where trucks waited to carry them back up. The “Ride Up Slide Down” system ended when the state opened big Gore Mountain adjacent to the Ski Bowl in the 1960s – along with Lake Placid’s Whiteface Mountain, it’s one of the Adirondack’s two premier, state-run alpine areas. The big new area, however, effectively orphaned the old Ski Bowl, which over the years has seen rope tows, chair lifts, even a tubing park, but never really recovered its old glory. Until last winter, when the snow drought meant that high schoolers across the region had no place to race. Gore Mountain boss Mike Pratt, who’d been making limited snow for high school and masters racers at the Bowl – which has had lights and snowmaking since 2002, doubled down and opened the area for nine high school races. The Bowl became a scene: bonfires and cheering crowds of spectators following the buses from high schools two and three hours away. Impressed by the enthusiasm, Mike and his team set to work over the summer homologating a 2.5K sprint loop, and a 3.3K race loop. While the work is complete, the grand opening will line up with the opening day of Gore Mountain. “… Right before or the day after Thanksgiving, as long as we have the temperatures to make snow,” Mike said. Nordic day passes are $16 dollars. Water for snowmaking won’t be a problem – the Hudson River flows nearby, providing essentially unlimited quantities, and Gore has won a series of environmental awards for its efficient pumps and guns. When skiers arrive they’ll find what amounts to a Nordic skiing playground, says Steve Tomb, head coach of the Johnsburg High School Nordic team, and one of the real movers behind the new area. 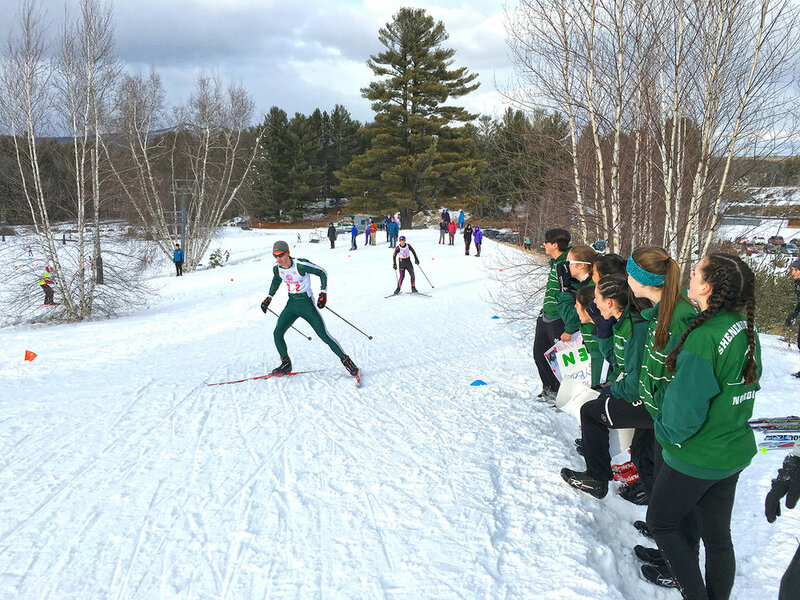 Gore will present Nordic Fest at the Ski Bowl on Friday-Sunday, Dec. 16-18 with high school, masters and NYSSRA-Nordic ski races, 5K Snowshoe Race and post-race party. “It’s going to be like Friday Night Lights here,” Steve says, including the lights, installed when the area was being used for tubing in recent years. In fact, the area is so wired that he says there will soon be dedicated Wi-Fi cameras installed throughout the loop. And it’s not just his Johnsburg team that’s excited about the development. “We are psyched in NYSPHSAA Section 2!” Steve wrote in an email, “With homologated International Ski Federation 2.5K and 1.5K sprint courses, as well as a Nordic cross loop; all with lights, snowmaking and Piston Bully grooming, we finally have a venue where we know that we can train and race.” The irony for the team and Section 2 skiers is that they don’t know yet how incredible this is for them, the sport, and the future of Nordic skiing in New York. Allan Serrano, event director for the American Birkebeiner, is also a FIS homologator for Eastern areas, and he arrived at the Ski Bowl in early autumn to oversee final plans. Several things impressed him, he said, including the equipment and expertise that the Gore crew brought to bear. Nordic ski areas rarely have easy access to bulldozers, or to highly-developed sandy slopes that can be easily regraded for a perfect ski course. “It’s a unique circumstance,” he said, and the result is a course that will be nine meters wide in many places with powerfully banked turns, and almost all of it visible to spectators at the bottom. The main A-climb (light blue), Allan says, is “almost out of the textbook.” It goes up the old tow rope, cuts across a short level patch, and then surges up a steep wall. “That’s where you’ll really see the separation,” Allan predicts. And at the top of the hill, there’s a section of rolling flat instead of an immediate flat, so there will be no chance for instant recovery. Location means that the area will offer skiers the best of all worlds. For those looking for some of the prettiest old-school trails in the northeast, Garnet Hill Lodge with 55K of ski trails is just a few miles drive away. In recent years locals have rehabilitated the original North Creek trails that spill out in the Ski Bowl, if you want a day of sublime telemarking. The Bowl’s other advantage, however, is that it’s closer to civilization than most cross-country ski areas: the town of North Creek is a few hundred yards away, full of taverns and restaurants including barVino, the classy but downhome eatery whose stools were the site of much of the planning for the new area. Bill McKibben (bill.mckibben@gmail.com) is an author, educator, environmentalist and founder of 350.org. He resides in Ripton, Vt. and Johnsburg, where he spends as much time as possible outdoors.